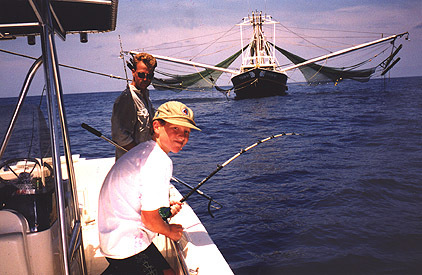 Photo of recreational and commercial fishing on the same ocean!!!! This is a photo provided by Captain Monty Weeks (link to his site is provided below) and was taken 32 miles due south of Freeport, Texas. In his words "The presence of the (shrimp) trawler shown in the background contributed to an outstanding day of fishing. The red snapper on the end of Zach's line weighed in at 15 pounds, 6 ounces. It is my hope that the image can promote increasingly better relations between user groups in our fisheries." It's our hope as well. Thanks for the photo, Captain Monty.